There are a lot of questions whether or not the Oregon Ducks will return in the 2015 season as talented as they ended the previous season. When a team is good, people talk. It’s the same concept for players; when a player is exceptionally good, people talk. Well, people are talking about the loss of Marcus Mariota and how it will affect the team going into the 2015-16 season. Having the best quarterback in the nation has led many people to believe that without Mariota, the Ducks are bound for failure. All I have to say to that is, one player doesn’t determine the team’s destiny! Yes, no longer having Mariota will be difficult, and there will be a lot of adjustments. However, Mariota wasn’t the only talented one on the offensive side of the ball these past couple of years! Especially not this past season. Did he throw the ball down field and run and catch it himself? No. Did he run every touchdown into the end-zone? No. As a fan base, not seeing Marcus Mariota on the field in a Ducks uniform doing unbelievable things will be hard. But it’s important we appreciate Oregon’s returning talent! On the offensive side of the ball the Ducks have multiple players who will make up for the loss of Mariota. And who’s to say that whoever earns the position of starting QB for the Ducks won’t be good, too? We can’t assume that our Ducks are doomed for failure when we have players that foreshadow a bright future! 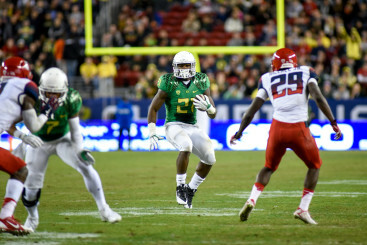 Royce Freeman in the Pac-12 Championship. For example, powerhouse sophomore-to-be Royce Freeman runs the ball straight through a group of guys and makes it look easy. Bralon Addison is an asset at receiver, Pharaoh Brown could be returning to the field after being injured in the Utah game earlier this season in the tight end position, AND tackle Tyler Johnstone will be back on the field to protect our QB (whoever that may be). In short, the offense is going to be perfectly fine. If there is an area that needs concern, it’s on the defensive end of things. Our Ducks suffered far greater loss on their side than the offense did (more or less; there’s no replacing Mariota). Going into the ’15-’16 season the Oregon defense will be without Arik Armstead, Ifo Ekpre-Olomu, Erick Dargan and Troy Hill. 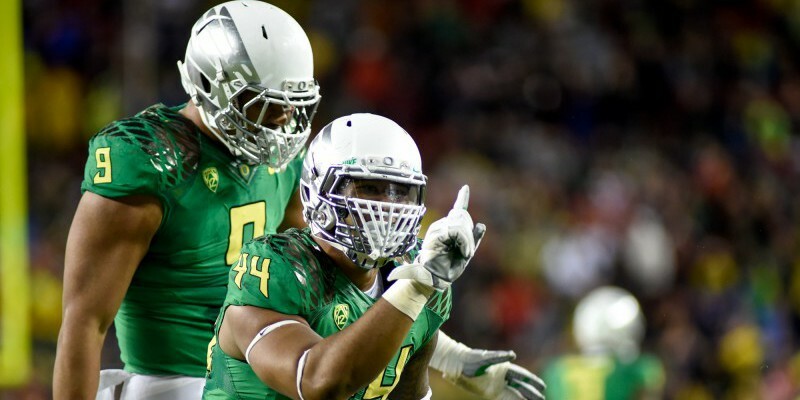 Our defense is not doomed, because when it comes to the Oregon Ducks, failure isn’t even an option. However, the window for improvement is slightly larger for the defense than it is for offense. When it comes to the team as a whole, our Ducks are going to be fine. We support a program that wants success more than any other team and is more than willing to put in the time and work to make sure they are the best. We, as fans, just have to remember that we love our Ducks no matter what happens on that field and have faith that they’re going to do everything they can to make us proud. Go Ducks!